Here's the pattern for the piece of glass I need to replace. You can see it's got a very small chip in it, just a crack that went down and came right back up. I put foil on the broken glass and soldered over it. It looked fine until Jeanne cleaned the glass and then it stuck out like a sore thumb, there was no way to cover it up, so we have to replace it. I drew a line on the glass to show a method I considered, just placing foil on the curve of the red mark and making a false lead line. This would have been okay, but it would have diminished the look of the big panel. 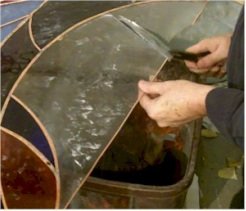 I did an article about that type of repair and you can view it by clicking here. 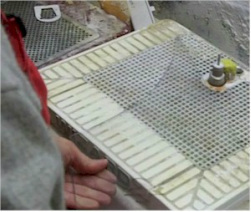 I start by scoring the piece of glass many times, cutting it in strips about 1" wide. When I finish cutting in one direction, I go in the opposite direction. I make sure to get a score right into the corner so I can remove that glass easily. I then need to slide the glass out so that I can break it loose. As I do so, I find that the end of the panel is wobbly, so I slide a stick under the panel to provide extra support. The stick spans from the worktable to the saw table. I place a trash can below the window. Then I can begin breaking out the pieces of glass. When I get to where I tried to patch the break in the glass, it's pretty easy to see. I continue to break out the pieces of unwanted glass. Then I take a hot iron and melt the solder. I hold the foil, that was holding the old piece of glass in, gently and pull it as it's released. With the foil removed, I run the iron under the edge of the glass to get rid of any "icicles" that might catch as I slide the panel back onto the bench. 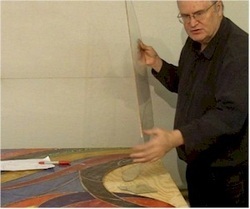 I remove the stick that has been holding the end of the panel while I support the panel and slide the stained glass onto the work table. The replacement piece of glass takes up a good portion of a full sheet. I trace it out and then score and break off the extra glass. 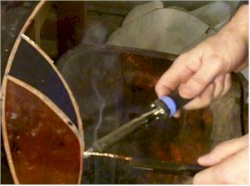 I then cut it out like any normal piece of glass, using a hand cutter and our orange glass cutting oil. 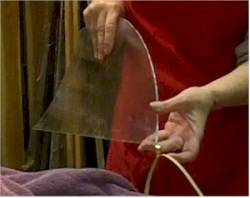 Then Jeanne grinds the rough edges off of the glass so she won't get cut. She then dries the glass off with a towel. And she foils the glass with 1/4" copper foil. She goes all around the piece, pinching and holding the foil in place. Then she uses a fid to burnish the foil tightly to the glass. I can now place two pieces of scrap glass onto the work table to hold the replacement piece to the correct height. I set it in place and check that the edge lines up with the other glass. 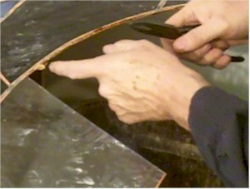 Since the nails and pattern are removed, I use the stick I used earlier as a straight edge to insure that the glass is flat along the bottom of the panel. 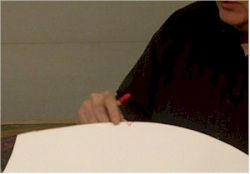 I apply flux to several spots along the replacement piece. And I solder the joints to hold the replacement piece in place. I then completely solder the repair in place. Later I'll turn the panel over and solder the backside.